Sadahiro Otani Was born in Osaka (Japan). He studied with Yoshikuni Onishi and Keigo Fujii in Japan and with Alex Garrobé, Fernando Rodríguez and Arnaldur Arnarson in Spain, obtaining his postgraduate diploma. He participated in masterclasses with David Russell, Manuel Barrueco, Joaquín Clerch , Marco Socías, Hopkinson Smith, William Waters and Jordi Savall. In 1992, he won the first prize at the "X Spanish Guitar Competition" in Tokio and "I International Guitar Competition" in Okinawa. In 1997 he obtained a Diploma de Honor in the "XVIII Concurso Internacional María Canals" in Barcelona. 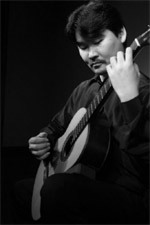 In 1998, Sadahiro was awarded Best Guitar Interpreter at the "Festival de Músicos Jóvenes de Barcelona". In 1999, he was first prize-winner at II Concurso Internacional de Guitarra "Ciudad de Coria". In 2003, he won the first prize at the "Concurso Internacional de Guitarra de Zarautz". He has performed solo recitals in Japan (Tokio, Osaka, Kyoto, Sendai, Okinawa), Spain and Italy, and at important international festivals. He has recorded for radio and TV in Spain and Japan. He is teacher of guitar at the Escola d'Arts Musicals Luthier and Escola de Música de Barcelona. In 2001, he became a member of Ensemble Barcelona Nova Música and peformed with this ensemble in Barcelona and Amsterdam.